R&D on highly parallelized/distributed systems and algorithms, and high performance computing tools. Development of new parallelizing or distributing techniques in several level, and application of them to several areas including AI. In most science areas, which include DNA & molecule designs in micron level and earth environment sciences in macro level, it is so important to extract meaningful information from big data, which is superficially useless data with huge size. The extraction techniques are called data mining. Data mining is so costly that it is difficult to process it in traditional ways. To achieve much more efficient data mining and result in innovative science technologies, we have to enhance parallelization and distribution in algorithms and execution styles. protocols. In addition, we will design new parallel/distributed models based onknowledges given by cell signal processing or social insects. Eventually, we will apply these techniques and models to several areas such as image processing, power systems, machine learning, robot systems, software engineering tools and so on, including data mining. 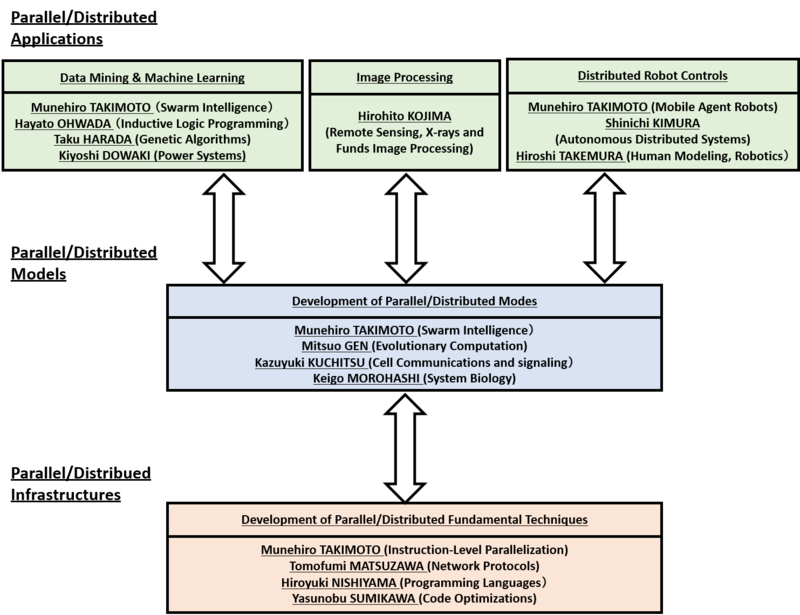 In the application level, considering three applications, “data mining & machine learning”, “image processing” and “distributed robot controls”, their special researchers improve system performance using application-level techniques such as a cloud computing. In the Infrastructure level, considering “programming languages”, “language processors” and “network protocols”, their special researchers directly improve the parallelization and distribution techniques on various infrastructures. In the model level, considering“ evolutionary computation”,“ cell communications” and “biological systems”, their special researchers develop models for making infrastructures work more efficiently. Also, they develop new models through which the improvements of infrastructures directly lead to the speedup of applications. Fig. 2. Relation between a milking robot and A.I. As shown in Fig. 2, the purpose of this project is to generate an endocrine model based on the transition of the ratio of pheromones to milk components automatically given by a milking robot. Precise prediction of the endocrine enables cows to always be enceinte, so that the amount of milk generated by the cows can be kept constant. To generate the endocrine model, we use inductive logic programming, which is one of A.I. methods. Fig. 3. Relation between a suckling robot and A.I. In this project, as shown in Fig. 3, A.I. generates a manual for operating a suckling robot, which can automatically give the suitable amount of milk to each calf at suitable time. However, it is difficult to decide several parameters depending on the condition of each calf. A.I. generates a suckling model through assessing the conditions of calves suckled by the robots. The suckling model results in a manual for operating the robots. Fig. 4. Relation among grass managements, gazing managements and A.I. In this project, A.I. optimizes grass and gazing managements using information from several sensors and images that drones give, as shown in Fig. 4. The grass that cattle have may include some kinds of plants not good to them. Such plants become found by A.I. through feedbacks from the sensors and drones, so that grass and gazing managements can be developed semi-automatically. Development of highly parallelized/distributed AI systems that can handle manually processed huge data, and multiple robots for practical missions. This research division aims to give effective domain specific parallelization/distribution solutions for each system in various levels. The solutions include the design of parallel models inspired from cell signal processing or social insects. We believe that the challenges of this division will open new horizons for parallel or distributed systems.